It’s amazing that The Gifted has managed to build out a world that looks and feels as lush and well thought-out as it does. Last night’s “EXit strategy” Wasn’t the series’ most visually stunning episode, but what it lacked in special effects, it more than made up for in character development. ‘EXit strategy” finally brings all of The Gifted’s players back together. After finally getting some degree of control over her powers, Blink is finally settling in as one of the Mutant Underground’s primary power players, but it’s obvious to her that something is amiss. The Gifted easily could have glossed over the way that Dreamer implanted false memories in Blink last week, but instead the series is doing the smart thing and gradually unpacking the ramifications of Dreamer’s decision. Both she and Thunderbird knows that Blink was manipulated in a way that’s both morally questionable and could put them all in danger, given the way that her powers are tied to her emotional state. The show is carefully circling around the inevitable moment that Blink realizes that her trust has been betrayed, but the gradual tension that’s building within the Mutant Underground is giving that moment a very necessary weight and import. The bulk of “eXit strategy” centers on the Mutant Underground plotting to free Reed Strucker and Lorna from Sentinel Services during a scheduled move. It was inevitable that Lorna and Reed would interact with one another while being detained, but it was incredibly satisfying to see Lorna calling Reed out for being complicit in the anti-mutant hellscape that is her life. 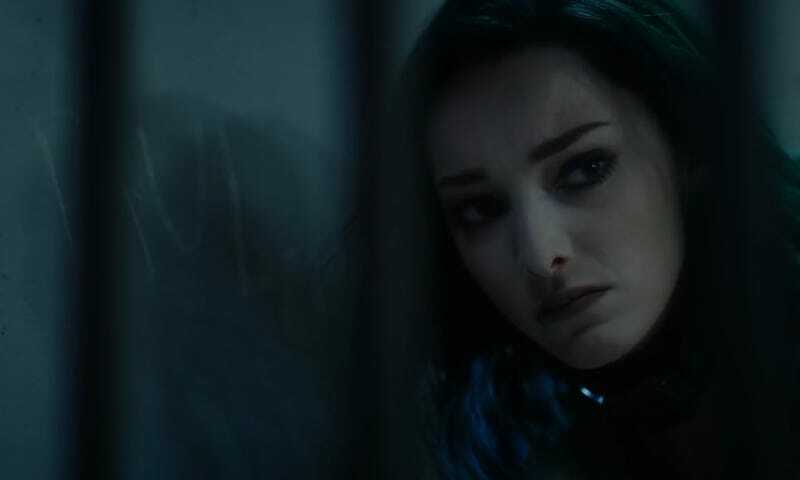 The Gifted has relied on showcasing just how out of touch the Strucker adults apparently were with the plight of mutants, but it’s in that moment that Lorna confronts Reed that the show is at its strongest. The dystopia that these mutants are living in isn’t horrible because they’re being hunted by huge robots; it’s because of people like Reed to turn a blind eye to the human rights injustices that organizations like Sentinel Services commit on a daily basis. The Mutant Underground’s plan pulls Eclipse back into the life he lived before he was a mutant fugitive and reunites him with Carmen, The Gifted’s most interesting side character to date. Seeing Eclipse as Carmen’s mutant plaything adds another fascinating layer to the show’s overarching story about the world hating mutants. You get the sense that Carmen wasn’t with Eclipse just because he was a handsome man with whom she had chemistry, but rather because there was an element of mutant fetishization to their relationship. It’s clear that Carmen sees Eclipse’s relationship with Polaris as a slight and it’ll be interesting to watch that dynamic play out if (god willing) Carmen makes a return later this season. The Mutant Underground’s plan to free Lorna and Reed is complicated by the most over-used mutant problem: a mutant with the ability to cancel out others’ X-gene. But it’s in those few scenes where no one’s powers work that you really get a feel for everyone’s humanity. The Gifted has never really been a show about people who protect themselves with their abilities, but rather one about people who protect themselves because of their abilities. Seeing everyone struggle to make sense of how to fight in absence of their abilities grounded “eXit strategy” in a way the series didn’t necessarily need, but was narratively fantastic. “EXit strategy” is definitely one of The Gifted’s stronger episodes, but it still doesn’t quite give a strong idea of where the show is ultimately going to go. As a series, the series has shown that it understands how to dig into complex interiority quite well, but when it comes to actually moving its cast of outcasts from one place to another, that’s all still very much up in the air.